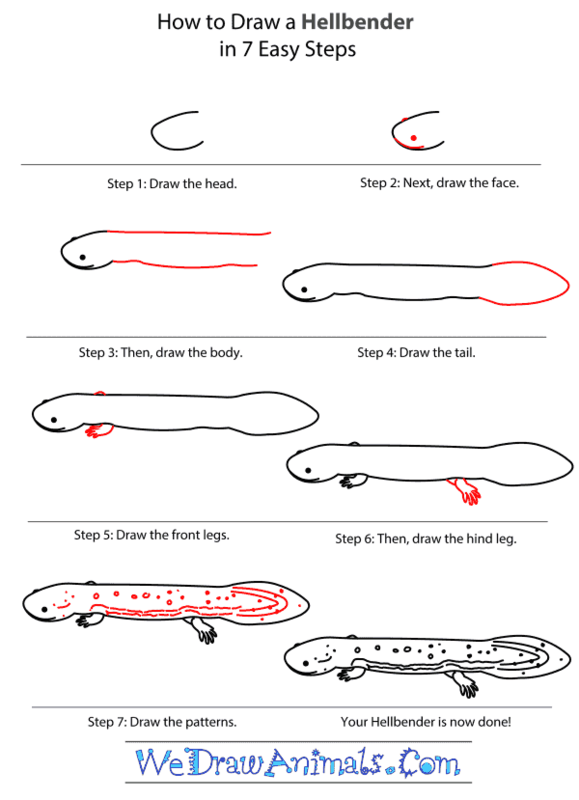 In this quick tutorial you'll learn how to draw a Hellbender in 7 easy steps - great for kids and novice artists. 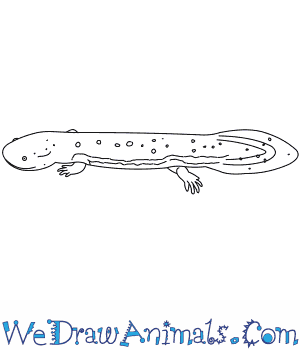 At the bottom you can read some interesting facts about the Hellbender. 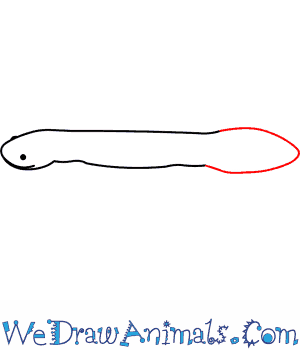 Step 1: Draw a stretched-out C.
Step 2: Draw one dot on top of the C-shape, and one inside of it, near the bottom. 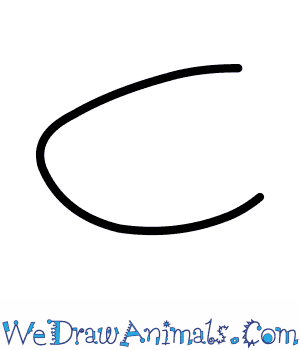 Draw a curve from the middle that goes down and then up under the eye. Step 3: Draw a straight line going back from the top end of the head, and a curved line going back from the bottom end of the head. Step 4: Connect the ends of the body with a curve that stretches out in the middle and narrows into a slight point at the end. Step 5: On top of the body, near the back of the head, draw a small semicircle. At the same point underneath the body, draw a curve that goes down and forwards, bends into a five-pointed shape, then curves back into the body. Step 6: Under the body, a little in front of the tail, draw a curve that goes down and back, then bends into a five-pointed shape, and then curves back up into the body. 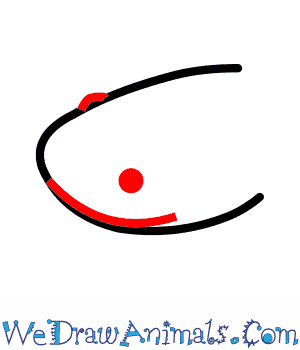 Draw a small line in front of this shape that connects the body to the curve of the leg. 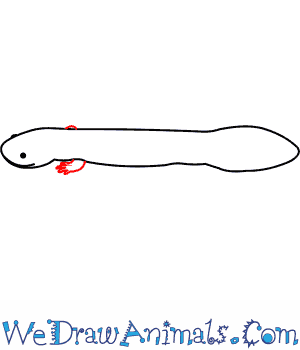 Step 7: Draw a pattern of lines, dots, and small circles all over the body. Done! You can color it brown or reddish-brown. The Hellbender is a member of the amphibian group and the scientific term for them is Cryptobranchus alleganiensis. This species derived its name from the “flickering fire” appearance of its undulating fiery orange and shapeless body with tiny eyes. The Greek name Crypto-branchus means “hidden-gill” in English. 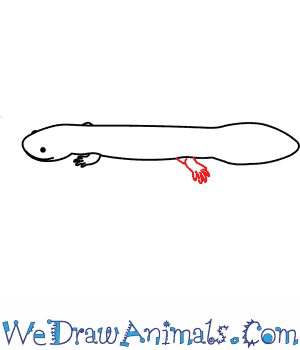 This is based on the observation that they have internal gills as opposed to their close relative the Mudpuppy. Other popular names for the Hellbender are the Mud-Devil, Mud dog, Devil Dog, Allegheny Alligator, Grampus, Leverian Water Newt, and Snot Otter. As the last of the names suggests, their skin is slimy. This animal was first documented in 1803. 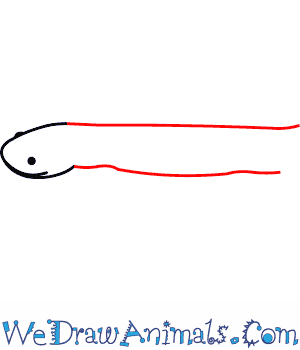 Their body is up to 2.5 feet long. They weigh up to 5.5 pounds. This species is about 65 million years old. They live up to 30 years old. 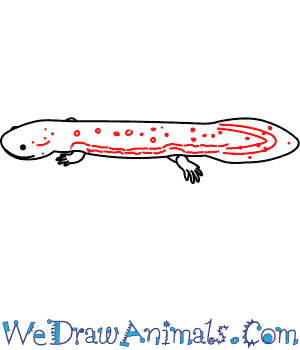 They are a relative of the Giant Salamander and live in eastern North America. As a unique trait, they breathe through their skin. These are different than other Salamanders, not only in their much larger size, but in their flattened body with thick folds, a single open gill slit on each side, and feet with five toes. These animals have a low population amount, and are considered to be near threatened for the possibility of extinction.